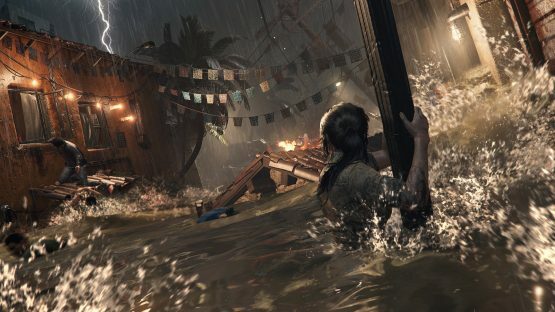 Shadow of the Tomb Raider releases in just a day, and in case your memories of Lara Croft’s adventures are hazy, we have a handy story primer to get you back up to speed. It was Rise of the Tomb Raider where we were first introduced to Trinity in the games, but Lara had run into them much sooner. In 2014, Square Enix and Crystal Dynamics teamed up with DK Publishing and two fabulous authors, Dan Abnett and Nik Vincent, to publish an in-betweener novel: Tomb Raider: The Ten Thousand Immortals. It takes place after the first arc of the Tomb Raider comics from Dark Horse (written by Gail Simone) and before Rise of the Tomb Raider. This is how Lara first met Trinity. It all goes back to the Yamatai. That legend started Lara on her first archaeological adventure, and it caused her meeting with Trinity. The first arc of the comics tells the story of Lara and her best friend, Sam, returning to London as flatmates and trying to move on with their lives. Lara is rather tense, Sam is tense, and no one is very happy. Lara can’t turn her survival instincts off—jumps at everything, rushes into a fight that’s not needed, etc.—and well, Sam has some pretty deep post-traumatic stress disorder. Lara might have stopped the Sun Queen ritual, but Sam still hears Himiko in her head. Even though Sam insists everything is just hunky-dory, it’s not long before Himiko takes over her thoughts and Sam attacks a man on the street while out on a morning run. The arc ends with Sam in jail telling Lara to go away. Of course, Lara isn’t going to leave her friend to rot in jail. She is able to get her some help and move her to a psych ward, but Lara just knows simple psychotherapy won’t get Himiko out of Sam’s head. There’s an ancient cure-all legend, of course, and even though it’s right out of Greek mythology, Lara gets wind that it might truly exist. Ever heard the tale of Jason and the Golden Fleece? 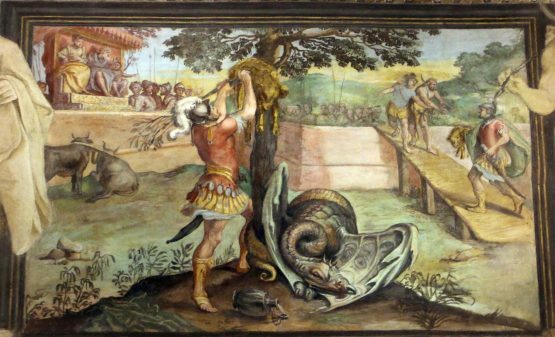 In case you don’t know about Jason, the Argonauts, and the Golden Fleece, here’s a very brief recap. Jason was sent on a quest to find a fleece literally made out of gold. You couldn’t make a sweater out of this fleece, but it has other properties instead. According to later legends, the Golden Fleece also has strong healing powers. (In the time of Jason and the Argonauts, it was merely a great treasure and a sign of kingship.) Lara is after the Fleece to possibly heal Sam’s tortured mind. Almost immediately after finding her first clue about the Fleece, Lara meets some of the faces behind Trinity. They are (unsurprisingly) after the Fleece as well. Lara mentions in Shadow of the Tomb Raider that Trinity wants to uncover all of the world’s priceless artifacts for themselves, but it goes a little deeper than that. While yes, they are most certainly looking to keep ancient precious treasures for themselves, they have bigger interests in specific artifacts like the Golden Fleece. Like the Divine Source. Noticing a pattern? Trinity is set find a way to achieve their own immortality, and not the immortality of songs and history books. That is how Lara knew they’d be after the Divine Source at the outset of Rise of the Tomb Raider. In Shadow of the Tomb Raider, Trinity is after a similar type artifact. It’s not entirely one for immortality, but it was the second part of their goal. In this case, Phase 2 is not ???. Phase 2 is about ruling the world the way they see fit. If they can’t be immortal, then they’re more than happy to do it with [redacted]. Crystal Dynamics has partnered with another book publisher, Titan Books this time, for a prequel to Shadow of the Tomb Raider. Called Shadow of the Tomb Raider: Path of the Apocalypse, it connects events leading up to the beginning of the game. In other words, it’s another quest to stop Trinity from obtaining a priceless artifact with immortality ties. It will probably also explain how Lara got a lead to go to Cozumel in the first place. I’m definitely checking that one out.